Asp.net development team working on Insider Window program can now download SDK (Software Development Kit) for Windows 10 to preview. The biggest highlight of this SDK is Universal platform for Windows app development. This SDK will be available along with tooling for robust app designing and development. The main objective of designing this SDK is to simplify app development process for asp.net developers that are considered very complex and tough from developer point of view. Universal app development means design once and used it everywhere. The application developed using Windows 10 SDK can be used anywhere and compatible with variety of platforms. Next achievement is adaptive UI that helps user a lot in understanding about the software or application. UI can be configured itself based on user interactions that can be taken as key strength of this SDK. 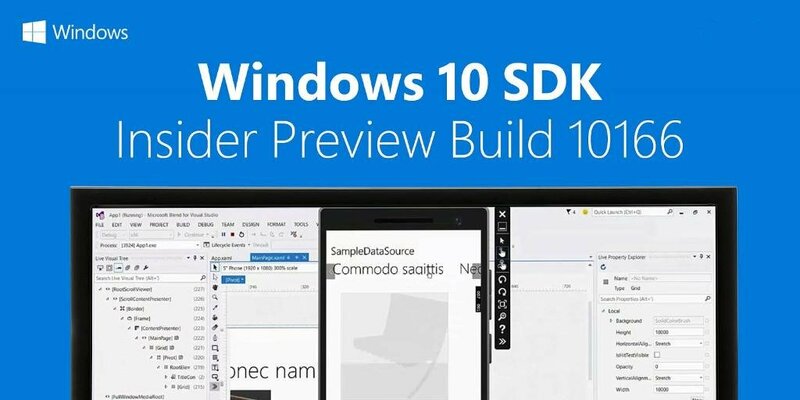 The exciting news for developers is that Windows 10 SDK has been released for preview. This SDK bundles set of tools together that helps in writing apps and easy to configure for different devices. According to experts, SDK also contains set of tools to test application on different parameters. The SDK also has an Xbox attached with it. Developers who developed web app using asp.net would also be able to use testing and other tools as the part of preview. New diagnostic tools available with SDK are just wonderful that will help developers in writing error free code. These tools can be used to test apps at different stages that will enhance performance and overall efficiency of apps. For more updates on SDK, stay tuned with us. You can also download this development kit for Windows 10 from Microsoft website and don’t forget to read the instructions written over it before starting programming over it.